Heat oven to 350°F. In ungreased 13x9-inch (3-quart) glass baking dish, mix pie filling, raspberries and 1/4 cup sugar. In medium bowl, break up cookie dough. Add oats; mix well. Crumble mixture evenly over fruit mixture. Sprinkle 2 tablespoons sugar over top. Bake 50 to 60 minutes or until topping is golden brown. Cool slightly before serving, about 45 minutes. Serve with ice cream. 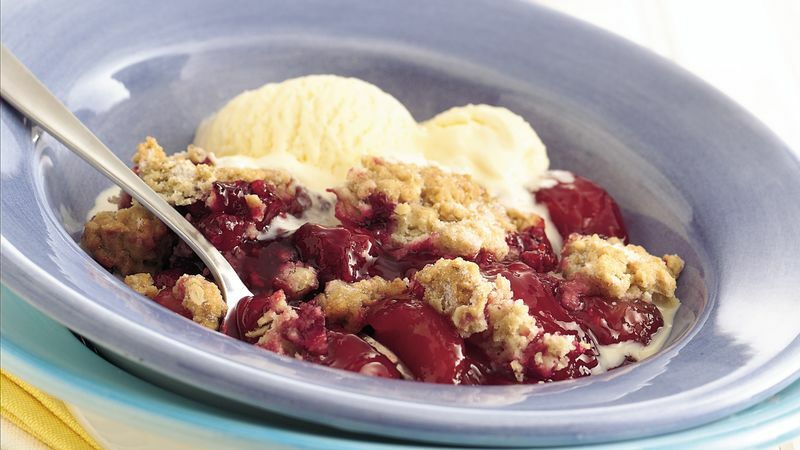 Cookie dough isn’t only for cookies; it makes a great topping for your cobblers or crisps! Old-fashioned oats can be used in the topping mixture, but it will have a coarser, more crumbly texture.